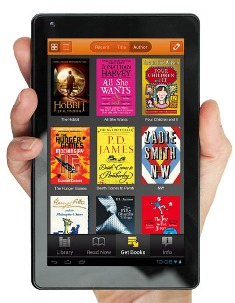 We’ve all heard about Amazon’s latest colour version of the Kindle – the Kindle Fire. But suppose you don’t want to be a slave to the online retail giant? Soon wholesaler Gardners Books will launch the £59 GoTab, a six-inch Android tablet that promises to fit right in your pocket. The supporting Hive Reader app allows customers to download e-books directly from the Hive website and assign their account to their favourite local bookshop. Bob Jackson, commercial director at Gardners, called the inclusion of the forthcoming Hive reader app on the GoTab "a huge opportunity for independent booksellers to compete with online multinational retailers and embrace 'going digital' by selling e-books whilst retaining their loyal customer base." The death of the printed page? The arrival of the ebook has led to the oft-trumpeted cry that this new innovation will spell the end for traditionally-printed books. However, a recent survey by the Joan Ganz Cooney Center at Sesame Workshop has found almost the precise opposite: it appears that 89.9% of iPad owners read "mostly print books and some e-books" with their children, and that 7.5% read both formats equally with their children, with a mere 2.7% reading "mostly or exclusively" e-books. Almost 75% of the responding parents said they prefer co-reading print books, with more than 50% of their children agreeing. Fewer than 10% of parents or children prefer co-reading e-books exclusively. This is something that I for one am glad of: while ebooks can play a supporting role for children in terms of animation and interaction, and while adults appreciate the convenience of ebooks (does anyone else now love the fact that they don’t have to line their suitcase with books and pay excess baggage on them every time they go away?! ), to my mind there is still value for children in enjoying the weight of a book, being able to flick through pages, getting away from a backlit screen, and using their own imaginations. To many people’s relief, it therefore seems that there are ways for ebooks and print media to peacefully coexist – so let’s clean off that shovel and stop digging that gravestone. We may not be leaving behind the humble paperback just yet, but according to a report by ABC News, copies of EL James’ Fifty Shades of Grey trilogy are being consigned to this very fate. Apparently the books in the series are the ones that are most often left behind at Travelodge UK properties. Travelodge’s annual survey found that 7,000 copies of the novel were discarded, amounting to nearly one-third of the total 21,786 books left behind in 36,500 Travelodge hotel rooms. "It is interesting to see that our list is not dominated by celebrity biographies and chick lit books, which it has been in the past," a Travelodge spokeswoman told the Telegraph. While I am pleased that people are recycling books for others to enjoy and not simply ditching them, my inner literary snob was secretly pleased upon hearing this to know that people aren’t hanging on to this latest ‘masterpiece’ for future rereads. So once the desperate housewives are done with their Fifty Shades of Grey books, what could they be reading next? They could try Bobbi Brown’s Pretty Powerful, which claims to contain beauty stories to inspire confidence. The makeup mogul’s seventh title contains makeover ideas, product recommendations, expert tips, and of course beauty stories from hundreds of ordinary women. With six categories (natural, strong, radiant, bold, classic, and authentic), the book professes to start with who you are, rather than how you look, and each category is matched with a celebrity guide, including singer Estelle and philanthropist Lauren Bush. With a bit of luck, Bobbi’s guide to smoky eyes should send the Fifty Shades trilogy up in smoke. The Booker Prize shortlist has also been announced recently, with the final prize to be given on October 16th. Showcasing a truly international array of talent and a range of experience, the shortlist includes the well-known Hilary Mantel (Bring up the Bodes) and Will Self (Umbrella), as well as newer writers Jeet Thavil (Narcopolis) and Alison Moore (The Lighthouse). Completing the list are Tan Twan Eng (The Garden of Evening) and Deborah Levy (Swimming Home). Such a mixture is truly encouraging and means that the prize is still anybody’s game, although I for one am pleased to still see my favourite for the award, Will Self (of Great Apes fame) still on the list. A longlist of 14 contenders for the £20,000 Samuel Johnson Prize for nonfiction has also been named of late, with chair of judges David Willetts saying that the list "reflects the diverse range of high quality nonfiction available for readers to enjoy." A winner will be named on November 12th. To encourage boys to read (rarely an easy or pleasant task), parents could try the Ramion series this Halloween with Frank Hinks’ latest tale, The Body Collector. Full of muddy escapades and general ghostliness, there should also be plenty amuse adults while reading along thanks to the book’s dry humour, Boris’ infatuation with wicked witch Griselda (who treats him mean and keeps him keen), and messages of parental love. The fifteenth of the Ramion series (which starts with The Land of Lost Hair) will be out on October 15th, just in time for parents and children alike to enjoy during the Halloween season. Happy reading!